Sibongile Sityebi is a farmer at heart who works the soil at Asande Food Garden. This project was started tarted in 2008 by Gethrude Cuba from Gugulethu, Gugulethu, but when she moved to Joburg in 2009 the project was taken over by Sibongile. Vuyokazi joined him 2011, while Buyelwa joined at the start of 2018. The Asande farm received their Participatory Guarantee System (PGS) Certification in 2017. 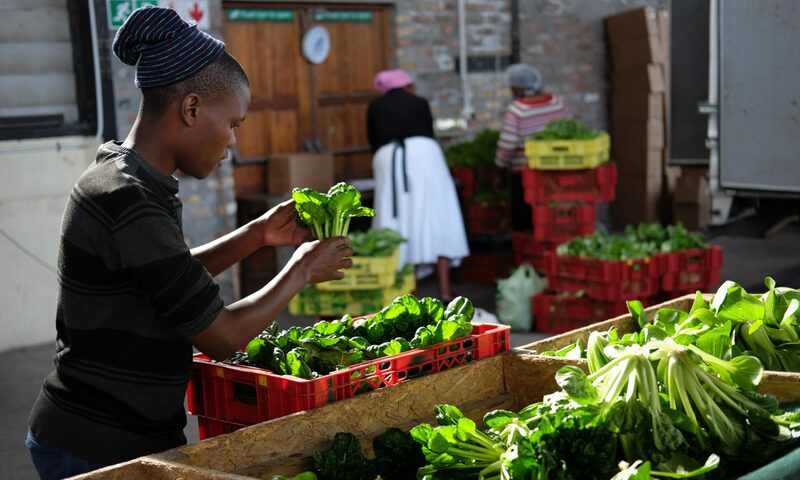 Sigongile joined the Food Sovereignty Campaign in 2016 to encourage the importance of food security. The Asande team saves their seeds and re-plant them annually to ensure good quality organic produce. The three members of Asande work to grow and sell their vegetables. They are based at Intshukumo High School (formerly known as Gugulethu Comprehensive School) and have received a lot of support from the school and the government. On Thursdays they have a market at the school for teachers and the local community. They joined up with Abalimi in 2010 to sell their vegetables through Harvest of Hope and participate in the training, such basic food gardening, Agriplanner, nutrition and focused farmer training workshops. They also did a marketing and financial management training course with the Department of Agriculture. Their vegetables are all seasonal and organic, including spinach, beetroot, broad beans, green beans, lettuce, fennel, turnips, broccoli, cauliflower, rhubarb, leeks, spring onion, and a variety of herbs such as rocket, coriander, parsley, basil, thyme, rosemary, organum and more. Click here for a map to the Asande Food Garden, opposite Nyanga Junction.